The ultimate Columbo dinner party: who’s on your guest list? One of the briskest debates I had with fellow Columbo fans on social media recently was on the subject of which of the show’s characters we’d invite to a lavish 70s’ dinner party. The combinations put forward made for rib-tickling reading, ranging from carefully calculated personality matches to downright lewd suggestions one step away from seven-in-a-bed romps (you know who you are, you filthy devils!). Still, it’s your fantasy dinner party, and I did canvas opinion, so invite who you will I say! The rules are few. Simply select 6-8 guests, preferably matched to ensure outstanding opportunities for back-slapping, smugness, exhibitions of mental superiority and raucous faux laughter, and let the (imaginary) fun begin. Top of the list, in no small measure due to his magnificent turn of phrase and impeccable manners (towards those he likes, at least). More importantly, because an exciting meal can easily be ruined by the presence of liquid filth, having a man of such discerning wine-matching skills has to be an advantage at a soiree of this calibre. Do ask: Whether this is a Pinot Noir or a Gamay. Don’t ask: Whether he’d like a splash of Merino Brothers’ carbonated rose with that. You want charm, wit and winning conversation? You got it with Ken Franklin, who would be impossible to beat for entertainment value. Watching ladies’ man Ken repeatedly trying to have his wicked way with every female guest would be quite rivetting. One suspects he’ll have his work cut out for him tonight. Do ask: How he’s settling in to his delightful new lakeside lodge. Even if her star is waning, Nora Chandler remains a household name, a fashionista extraordinaire and cracking company, well accustomed to the sort of shallow small-talk of the showbiz world that would make her a smash hit at any social gathering. She’d be the centre of attention without a doubt. Do ask: Where she got her fabulous octagonal sunglasses from. The human personification of ‘highbrow’, Dr Flemming is as much at home at upper-crust shindigs as much as Lieutenant Columbo is at a greasy diner. After leading the pre-dinner parlour games, place Raymundo near Oliver Brandt at the dining table and watch the cerebral mind games kick off in earnest. Do ask: What the fishing in Acapulco is like at this time of year. Don’t ask: What Mrs Flemming makes of his house calls to bikini-clad redheads. Every opulent 70s’ dinner party needs a dame of sass and personality to drive conversation and keep fellow guests on their toes. Goldie delivers both in spades, and would ensure there were no dull moments. Her end of the table would be where you’d secretly want to be sitting. Don’t ask: What she thinks of the current Mrs Bo Williamson. Bona fide genius Oliver Brandt may secretly be a sensitive and troubled soul, but his outward persona is that of a gregarious and witty lover of life, who thrives on debate and public displays of his colossal brain power. As such he’d be an electric presence at a select dinner party. He almost certainly drinks Carsini wines and would be BFFs with Dr Flemming. Do ask: Where the optimum place to keep one’s umbrella is. That’ll fuel him for 60 mins. He may be a vile toad, but give Dale Kingston a couple of glasses of Champers and an excuse to exhibit his superior knowledge of art and just watch him go! In an audience of intellects and bon viveurs he’d be in his element. And even if no one else understood his high-culture gags he’d fill any silence by yelling with laughter at his own jokes. Plus CRUSHED VELVET TUXEDO. ‘Nuff said. Do ask: His opinion of ‘hack’ artist Sam Franklin. Don’t ask: How his lovable Uncle Rudy is faring. A woman succeeding in a typically male-dominated profession, elegant legal eagle Leslie Williams is razor sharp, supremely confident and mildly flirtatious to boot. She’d be the mental equal of anyone around the dining table and could go toe-to-toe with any leering gents (yes, you, Ken Franklin) and knock ’em for six. Do ask: Whether she’ll take you for a joyride in her private plane. Don’t ask: Anything about her ‘charming’ step-daughter, Margaret. During the starter and main we’ll be serenaded by one Tommy Brown, who will play some gentle acoustic covers of his greatest biblical hits at a volume sensible enough to not interrupt conversations. He’ll be followed by the Great Santini, who’s jaw-dropping magical feats will be the perfect accompaniment to dessert, coffee and liqueurs. With French gourmet Paul Gerard regrettably unavailable due to filming some silly commercial for ‘Bon Snax’ crackers (how thoroughly low brow), laugh-a-minute celebrity TV chef Dexter Paris heroically steps into the breach. He’ll prove there’s more to him than just being a housewife’s favourite by whipping up a dazzling array of dishes, while also mingling and high-fiving guests before dashing off in his Ferrari 330 DTS, electric mixers safely in tow. Two hours after dessert is served, and the scenes are chaotic. A shambling Ken Franklin is propositioning a coat stand, his cheeks glowing red after receiving multiple slaps for unwanted attention paid to Goldie Williamson, who has had enough and headed for home in her solid gold cadillac. Dale Kingston, meanwhile, has been talking to himself about art for 40 minutes as he slops back the Champagne, sporadically roaring with laughter, apparently oblivious to the fact no one else is within ear shot. Oliver Brandt and Ray Flemming are trying to out-do each other by working through some brain teasers in the Mensa handbook, while Leslie and Nora are seated chummily on a chaise longue debating the merits of husbands over some stiff brandies. Meanwhile, Tommy Brown is somewhere in the garden, romping with a serving girl, but Santini vanished into thin air the moment his show was over and hasn’t been seen since. Only Adrian Carsini stands alone. The bitterness of tobacco fumes from his fellow guests’ cigarettes have long-since ruined the exciting taste experience that was the bottle of 1945 Ferrier Vintage Port he brought with him to impress the crowd. As he surveys the scenes of debaucherous one-upmanship, he allows himself a disdainful shake of the head. Let me know who’d make your list! And thanks, as always, for reading. Tags: Adrian Carsini, Dale Kingston, Dexter Paris, Goldie, Great Santini, Ken Franklin, Leslie Williams, Nora Chandler, Oliver Brandt, Ray Fleming, Ray Flemming, Tommy Brown. Bookmark the permalink. Previous post ← SPECIAL CHRISTMAS OFFER for Columbo fans! I think that Patrick McGoohan in any of his roles would be a must. And the actress who was Peter Falk’s real life wife, who appeared in many shows. I think Eric Prince would be great fun at a party and so would Hayden Danziger; the first for great gossip, and the second for class, and maybe some party games (shuffleboard anyone?). And I think Lily Stanhope would be a blast, maybe recite some Shakespeare. Can you even imagine her drinking with Goldie? Paul Gerard is a must. He would bring geishas too! And, probably Viveca Scott, for pure fashionists. I’ve been giving this some though. I welcome your commets . He’s charming,whitty,an intelect,impeccable manners and is sure to bring some superb claret to the gathering . No dinner party would be complete without a good chef. He could pass on his knowledge and would get on great guns with Adrian . She is harmless (apart from to people who murder her family members) charming old stick who everyome would gravitate towards due to her great warmth. She’s bound to have some great stories too. He’s just a very loveable jolly man. I hope Paul serves up some Eacargot for him. He would complmant any dinner party. All dinner parties need some glamour and she has this in spades . Just keep her away from yourself as we don’t want to see you 2 snogging all night. For his superlatives and superer mind. He’s good at parlor games too for our entertainment pre dinner. He would doubtless challenge Tomlin to a game. Just don’t overfill his scotch glass. He’s a cheeky chappie and all round fun guy. Bound to entertain everyone with his limerricks . Make sure he brings his banjo and get a bottle of Full’s Irish Due in. Ok so this may be a curve ball but he’s been working hard and Columbo just wanted to show his gratitude to his keen but hapless assistant. Nobody would get killed either as Wilson is bound to bring his crime fighting forensics kit to show of. So that’s my ultimate Columbo dinner party. I hope you enjoyed reading it. I dunno, it’s all a little highbrow for me. The vintage port, the snooty art critic…. Can you ask Tommy Brown to bring a great big bowl of squirrel meat chili for a more down-home atmosphere? Happy New Year everyone! Hope everyone got the Columbo episodes they wanted. Now down to this: who to invite to my New Years bash? I’m one who thinks 8 is great when it comes to parties; they’res lots of chances for all the group to have fun plus for the group to break down into clutches. So who to invite? 1 – Goldie Williamson – Is this even a question? I would like to pour her first drink and ask her the first opening question and let her go! She wouldn’t need any prodding and the stories of her first years of marriage to Bo will be a hoot. 2 – Abigail Mitchell – A great conversationalist with a lifetime of stories to draw on. Her and Goldie ought to hit it off, and I’m sure there would be a mutual appreciation of two people with lots of sauce. And while we’re pouring drinks, pour one for…..
3 – Lizzy Fielding – Forgot her? Alex Benedict’s imperious mother-in-law. Stuffed shirt? Hardly! Anyone who has drinks after work can’t be all bad. Most people like her have had ribald pasts, and with the right inducement (and the right drinks) I anticipate an evening of laughs of how the great and near-great in the theater blow off steam. And now the gentlemen…. (and I use the term loosely)…..
4 – Adrian Carsini – No doubt, the dry wit of Adrian will move the conversation along, and as he lets down his hair and enjoys the company of Goldie, he goes in the wine cellar and brings out a bottle of Chateau Lafite’s 1869, says “what the hell!” and opens the cork with his teeth. 5 – Arthur Kennicutt – In his honesty and vulnerability while discussing his wife, Arthur Kennicutt showed himself to be an interesting man with a depth of character. I’d like to give him the chance to let down his hair (no pun intended) and release himself from the pressure of being a mogul and encourage his conversation. My worry would be he would steer himself in a corner and spend too much time talking about deep subjects with Lizzy. Better get……..
6 – Joe Devlin! – Our two-fisted Irishman is both guest and entertainment tonight! The poor boy from the streets of Belfast will bring balance to the Force as his congenial nature and quest for fun keep the guests in drinks and stitches. Our affair is catered by…..
8 – Bo Williamson – Yes, he’s a hothead, but we never get to see the other side of his personality. A guy like Bo probably came by his money the hard way, working as a roughneck in the oil field, probably made and lost a couple of fortunes, and when they make it big, everyone is along for the party! I get the feeling Goldie kept him in good humour at many parties, and she’ll keep him in drinks and fun. And Bo will probably drink everyone under the table and offer to buy every bottle of wine in Carsini’s cellar! So here’s my party folks! Happy New Year! A brilliant list! Thanks so much for posting. Nice Star Wars reference, too! I think we should have surly Jamie Lee Curtis, working for the catering company, standing at the door to make sure no one brings his own food. Since I doubt Ken Franklin could contribute much to a dinner-table conversation about writing a mystery, I’d prefer to have Abigail Mitchell (“Try and Catch Me”) lead that discussion. And Goldie shouldn’t be left unprotected in a room otherwise full of murderers, so I’d add Ned Diamond (“Forgotten Lady”) to the guest list. 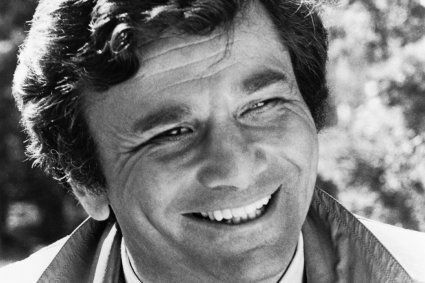 He may have once confessed to murder, but I trust Columbo straightened that all out. What can I say? It’s a very inspiring show! What about the IRA gunrunner played by Clive Revill – he could entertain with his limericks and ‘oirish’ charm. Personally I think reciting limericks is reason enough to ban folk from attending parties for LIFE. Surely you wouldn’t want to eat without Paul Gerard (Louis Jourdan) to evaluate the food and woo you with that accent Francais? He spilt sauce soubise on his tux on the way over and had to cancel last minute! If Paul Gérard was the chef I would kindly decline Fugu when brought out. The dinner party column is such a fun read!! Bravo! And I’d love to be invited.. The invite’s on its way!